There is a coffee shop in New Haven called Koffee Too, aka K2. There is an employee there with long, nappy hair and stringy facial scruff. This barista, whose name I do not know, transcends the townie/employee archetype. He is a tier-1 New Haven all star. Everyone knows who he is, even though they don’t think about it. You see him at shows, out on the street, on his bike. You just know him. In reality, you don’t. During the two years I spent at Yale, I went to K2 fairly often. I would estimate that 90% of the times that this guy served me, he was wearing the same worn-out, ratty t-shirt. It was purplish-blue, with small white stars printed on it to give the effect of the night sky. 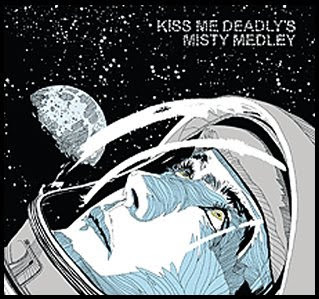 Above the drawing of an astronaut was printed: KISS ME DEADLYS. Turns out, as I suspected, that it is a band, though not a very well known one. A Google search (with quotations) brings up some myspace profiles and an ad for thong underwear. Amazon is more helpful. Within minutes not only have I located what appears to be the Kiss Me Deadlys only release, Misty Medley, but I’ve found a used copy for $.99. Sold, for the cost of shipping & handling. It arrived today. First of all, the packaging is really nice: a folding soft-case with--surprise--an astronaut floating through space looking pensively at the sky on the cover. The band members appear in similar pencil-drawn spacesuits on the inside cover, looking slightly emo. This concerns me since the album came out in 2005 and I may have just unwittingly given my first contribution to the emo movement that peaked around that time. The enemy. Also notable, song titles max out at 2 words. Your starting lineup includes "Dance 4", Dance 2" "Pop" "Let's" and "Groove." I realize that as far as first listens go, this one is really out there. But as I tune in, I’m immediately digging the band’s sound, which features driving rhythm, delayed reverbed guitars to match, and a breathy female voice tempting me with things I can’t understand. "Dance 2," the first track, ends as these whispers morph into screams. I’m along for the ride. Track 2 starts with some murmuring beats, another scream, and now we’re rolling: “We’ve got to think it over/ you said that the last time/ you said that the time before.” Brevity; I approve. I soon realize that the space motif that pervades the album (and the barista’s ratty t-shirt) is appropriate, if not deliberate. Between the vacuumish vocal effects, the mechanical pumping of the rhythm and twinkling guitars, this album feels a soundtrack for romance on space station Mir—only with more screaming. Male vocals make an appearance on a few tracks. Definitely weaker than the female, but the versatility is welcome. By track seven, I am impressed. It’s nothing entirely original. There’s a detectable dose of Modest Mouse and Yeah Yeah Yeahs in here. But Kiss Me Deadlys is tight, and the vocal styling is unique. On first listen, there seems to be a concept or purpose driving the music, and that feeling maintains coherence through most of the album. The production is also quite good, it bears noting. "Groove" is a notable high-point on the album, with the female and male vocalists trading the refrain “It doesn’t matter if you’re not alone” over a sparse but well-constructed instrumental backdrop that slows and speeds up intermittently. Enter strings for about 20 seconds before the end of the album—nice touch. Final Say: Good album, and I feel a bit of obscurist pride for having tracked this one down. I mean, any time you buy an album solely on the basis of a ratty shirt—well, you’ve got to be pleased with yourself. "Man, I really dig the Kiss Me Deadlys...oh, I'm sorry, you haven't heard of them?" I have half a mind to stop in K2 next time I’m in New Haven to thank the man responsible for my good fortune. I guarantee you he's wearing the shirt. Alas, questions lead to more questions in this twisted musical universe: Where are they from? Is Misty Medley their only album? Are they still around? The mystery continues. A few comments: His name is Ian. He is from New Haven. I have driven him in my car. The place is no longer called Koffee Too (as of September 2008), but Ian is still around (as of September 2008). Hey , i'm Matt from Kiss Me deadly. For your info the band was formed in Montréal, Qc by Adam Poulin and Emily Frazier both students at Mcgill university). Erik Petersen (from New Bedford,MA) joined on the drum and I did joined them after their first show. Welcome to Silver Soundz! Rejecting the immediatism of today's music journalism, this space is an unabashedly personal reflection of my unique sliver of a music scene. Genre distinctions and temporal boundaries are meaningless here. It’s all fair game. I hope what you read here makes you think, and makes you listen. Reactions welcome. Dig?